Snapchat will have $774.1 million in worldwide ad revenues this year, but it is growing more slowly than eMarketer predicted a year ago. 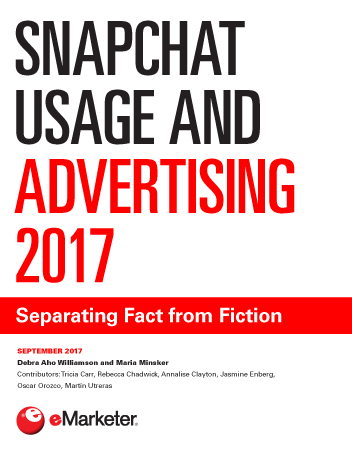 Although many advertisers remain on the sidelines, Snapchat’s ad products are tantalizing for some because of its creative capabilities; its highly engaged user base (which isn’t as young as some might think); and the role that some have given it, as the non-Facebook. Snapchat has been slow to add users in international markets, and while eMarketer has raised its US forecast to 79.2 million monthly active users (MAUs) this year to bring it in line with company-reported data, growth will slow in the US in succeeding years. There will be more US teens on Snapchat this year than on Facebook or Instagram. There are also more adults on Snapchat than some might think. eMarketer estimates US adult users will spend 26 minutes per day on Snapchat in 2017, slightly above the 25 minutes spent on Instagram. The threat from Instagram over Stories is real, but it’s too soon to declare a victor. There’s more to Snapchat than Stories. Snapchat has made several ad product advances in the past year, notably the launch of a self-serve ad buying system as well as targeting and creative tools for direct-response advertisers. It now has 15 measurement partners. Despite these advances, many advertisers remain skeptical. eMarketer has lowered its worldwide Snapchat ad revenue estimate for 2017 to $774 million. The US will continue to account for a strong majority of ad revenues—83% this year. With user growth rates slowing and ad revenues also lower than expected, Snapchat is in a challenging place. It must continue to work hard to convince marketers that it is an effective ad platform despite these negatives. "Snapchat’s worldwide ad revenues will grow 128% this year to reach $774 million, but that’s a lower figure than our previous forecasts." What’s Next for Ads on Snapchat?